The Town of Cicero is looking for food vendors to participate in the annual Houby Day celebration and parade that will be held September 29th through October 2. This year’s carnival and vendor booths will be set up in the L Strip at Lombard and Cermak. The parade is scheduled for Sunday, Oct. 2, 2016 and will begin in Cicero and head West to Berwyn. 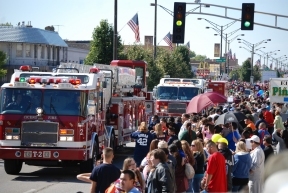 The parade start and direction alternates each year between Cicero and Berwyn. If you are a food vendor and are interested in participating in this year’s festival and parade as a vendor, please contact Patti Dominick at the Town of Cicero at 708-656-3600 x 258. Non-food vendors and applications to participate in the parade should be directed to Cynthia Salvino at 708-656-3600 x 288.